Definition at line 273349 of file Cxx_Grammar.h. 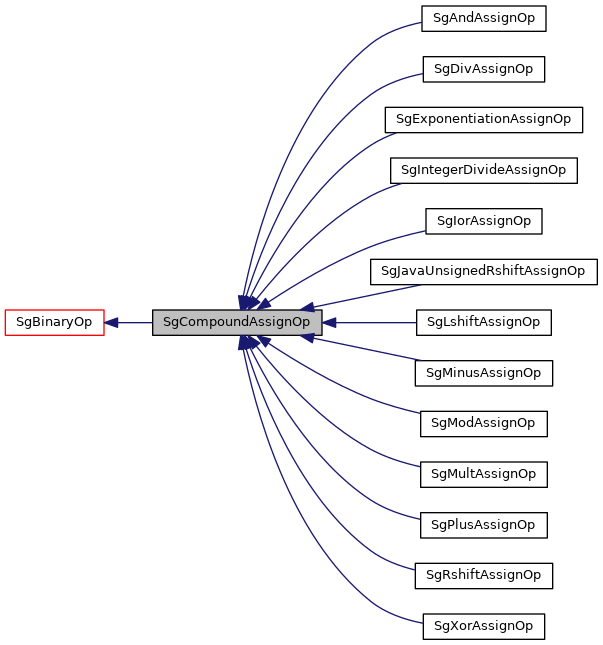 Reimplemented in SgExponentiationAssignOp, SgIntegerDivideAssignOp, SgJavaUnsignedRshiftAssignOp, SgRshiftAssignOp, SgLshiftAssignOp, SgXorAssignOp, SgModAssignOp, SgDivAssignOp, SgMultAssignOp, SgIorAssignOp, SgAndAssignOp, SgMinusAssignOp, and SgPlusAssignOp. For C and C++. When called from a node of any other language, behavior is undefined (see SageInterface::is_C*_language). Returns a bool value which is true if the current expression is an lvalue, as defined by the C++ standard. Returns true if the current expression is an lvalue. For C and C++. When called from a node of any other language, behavior is undefined (see SageInterface::is_C*_language). Returns a bool value which is true if the specified expression is used as an lvalue. That is, it is an lvalue and does not get converted to an rvalue by its parent expression.